Oh! My! Deliciousness! 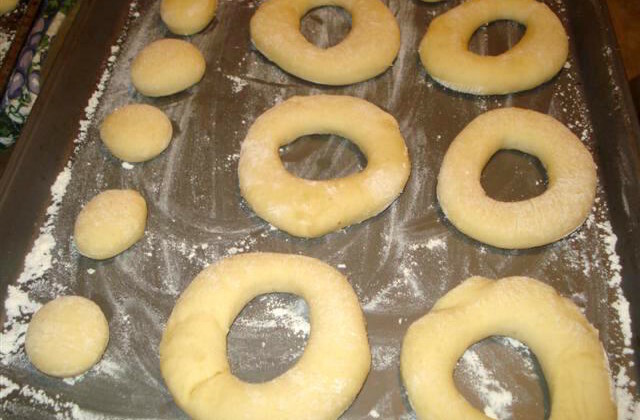 You have not lived, if you have never made homemade doughnuts. Warm fried dough,absolutely delicious! A couple of weeks ago there was a blogging event entitled Time to Make the Doughnuts! hosted by Tartelette. I learned about this event by reading Phe/MOM/enon blog where she made her doughnuts for this event using Alton Brown’s recipe. In my opinion, Alton Brown is a great culinary expert, I love the way he explains the science of cooking. Last Saturday morning, I made these doughnuts for breakfast. Everyone loved them. I covered our doughnuts with powdered sugar and others with a chocolate glaze. I never knew making your own doughnuts could be so easy. I do not have a lot of prior experience working with doughs (other than cookie dough). This year I have made more batches of various doughs than I ever have before, and am enjoying working with them. Making the doughnuts was really fun, it is something that you don’t get to do everyday. Sasha was right there in the kitchen wanting to help. After I rolled out the dough she was already using a glass to cut them out. It was a fun mother-daughter activity! I must apologize, I do not have any photos of the fresh doughnuts, we ate them all. Take the time and try this recipe, it was delicious. In a small bowl, sprinkle the yeast over the warm water and let dissolve for 5 minutes. After 5 minutes, pour the yeast mixture into the large bowl of a stand mixer and add the milk and shortening mixture, first making sure the milk and shortening mixture has cooled to lukewarm. Add the eggs, sugar, salt, nutmeg, and half of the flour. Using the paddle attachment, combine the ingredients on low speed until flour is incorporated and then turn the speed up to medium and beat until well combined. Add the remaining flour, combining on low speed at first, and then increase the speed to medium and beat well. Change to the dough hook attachment of the mixer and beat on medium speed until the dough pulls away from the bowl and becomes smooth, approximately 3 to 4 minutes. Transfer to a well-oiled bowl, cover, and let rise for 1 hour or until doubled in size. Preheat the oil in a deep fryer or Dutch oven to 365 degrees F. Gently place the doughnuts into the oil, 3 to 4 at a time. Cook for 1 minute per side. Transfer to a cooling rack placed in baking pan. Allow to cool for 15 to 20 minutes prior to glazing, if desired. Combine milk and vanilla in a medium saucepan and heat over low heat until warm. Sift confectioners' sugar into milk mixture. Whisk slowly, until well combined. Remove the glaze from the heat and set over a bowl of warm water. Dip doughnuts into the glaze, 1 at a time, and set on a draining rack placed in a half sheet pan for 5 minutes before serving.